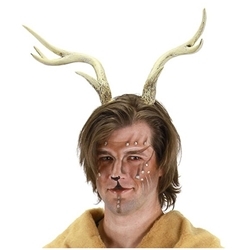 These deer antlers can be paired up with our hooves and fur collars to create an animal costume for Halloween. They can also be used for characters in theatrical productions such as Mr. Tumnus from The Lion, The Witch, and The Wardrobe. The deer antlers are colored as pictured. Antlers are one size fits most adults using clear adjustable straps that blend in with your hair.